Reservations can be made by calling 844.526.8600. WiFi is available in the RV Park. Pets are welcome if kept under control, quiet, and not left unattended. They must be kept on a leash at all times and relieved ONLY in designated pet areas. Please pick up after your pet. Pets are not allowed in any building (except service animals). Full Hook-up sites are $30 a night. Overnight RV Parking IS Allowed. They also have a new RV Park. Good RV parking in marked lanes, slightly off-level, security patrolled. Some changes coming soon to the food availability, in the meantime Camas Restaurant offers good food, excellently prepared and served by attentive staff. Camas card also provides 10 cents per gallon discount at the fuel outlet. RV park also available at $30 per night FHU pull thru. Free dry-campng in carpark in marked lanes only small leveling blocks needed. Full RV park adjacent, FHU on blacktop at $30 per night. Good place to stop for night before crossing into Canada. 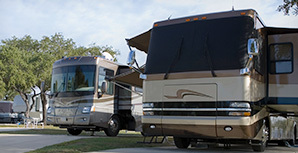 Free RV Camping is allowed with the usual check-in at Security. A Walmart and Home Depot are both about 2 miles up the road north and allow RV camping.